Roman numeral notation provides a concise and simple way to express both the scale degree and the quality of different chords. In a roman numeral, scale degrees are expressed as roman numbers (I to VII) for the seven diatonic degrees (tonic to leading-tone) with the additional feature that the roman number is capitalized if the chord is major or augmented and lower-case for minor or diminished chords. For diminished and augmented romans the characters ° and &plus; are additionally added to the roman. To distinguish minor from diminished chords, the diminished roman includes the diminished quality character 'o'. For more information about chord qualities, see Table of Chord Qualities. Seventh chords (and triads other than root position) are indicated by including inversion information in the roman. For information about chord inversions, see Table of Chord Inversions. A roman numeral can include a key as a constituent part of its symbol. For example, the first roman numeral in a work almost always provides the home key of the piece to indicate the tonality underlying the roman numerals of the analysis (see sonority 1, above). Later on in the composition, if the key changes, a direct modulation or a pivot modulation will include a new key in a roman to mark the point where the new tonality begins (see sonority 12, above). 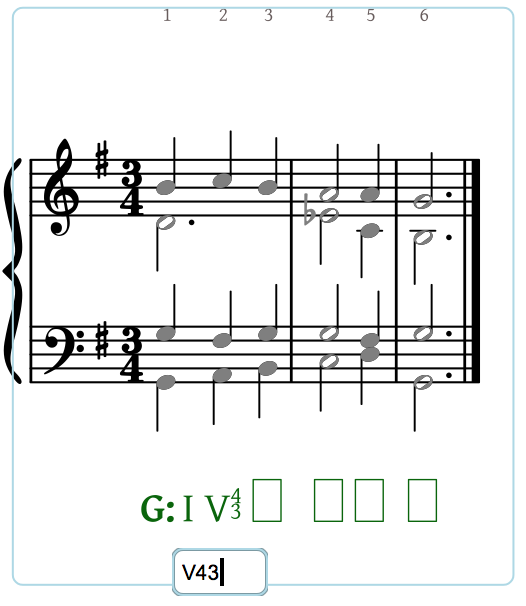 To enter a key you type text input that specifies the tonic and mode of the tonality followed by a colon ':'. For major keys the tonic pitch is upper-case, for minor keys the tonic pitch is lower-case. The colon serves to unambiguously identify the text as belonging to a key and separates it from the remaining text in the roman numeral. You may at some point need to provide a modal key, such as D dorian or A mixolydian. 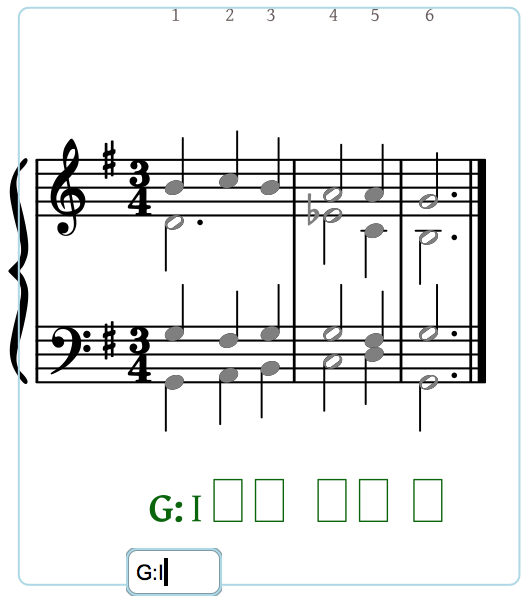 To enter a modal key you type an upper case tonic pitch , followed by enough of the mode name to make it unique and ending with a colon ':'. This table shows typical entries using the first three characters of the mode name. Note that there is no Ionian or Aeolian, use Major and Minor instead. The first (applied/secondary) chord should include whatever inversion information is necessary to describe the chord. The second (target) chord is the "theoretical goal" of the applied/secondary chord and should not include inversion information. There are two kinds of modulations: direct modulations and pivot modulations. A direct modulation simply asserts that a new tonality is been established at a particular chord. A pivot modulation identifies a single chord as being shared between the old tonality and the (new) tonality being established in the modulation. Since by definition a pivot chord belongs to both tonalities, it will require two roman numerals to describe it. To enter a direct modulation you type text input that consists of a key: and a roman number (which is almost always I, i.e. the tonic chord of the key being established.) From the software's perspective then, the key associated with the first entry in a roman numeral analysis is just a direct modulation that establishes the home key of the composition. For information about how to type keys in roman numerals see the section Major and Minor Keys. A cadential six-four chord is a voice-leading chord that often decorates a dominant chord at important cadence points. To specify a cadential six-four chord in the theory line you type either CV64 or CI64, depending on whether or not your teacher labels these chords using the V64 convention or the I64 convention. In minor modes, you would type Cv64 or Ci64 to reflect the mode of the cadential 64 chord. The "C" at the front of the symbol stands for "cadential" and distinguishes the chord from other second inversion, non-cadential chords. When the symbol is engraved in the theory line it will appear with two small lines on the right-hand side to indicate its special nature as a voice leading chord. a flat preceding the roman lowers its root from natural to flat or sharp to natural. a sharp preceding a roman raises its root from natural to sharp or flat to natural. leading tone chord in minor is by definition raised so not use a sharp. A Neapolitan chord is a chord built on the lowered-supertonic scale degree of a major or minor key. It is typically, but not always, found in first inversion. To enter a Neapolitan you type either an altered roman numeral or the special name N, optionally followed by the chord's inversion. If no inversion is specified the default inversion of a Neapolitan is root position, not first inversion. 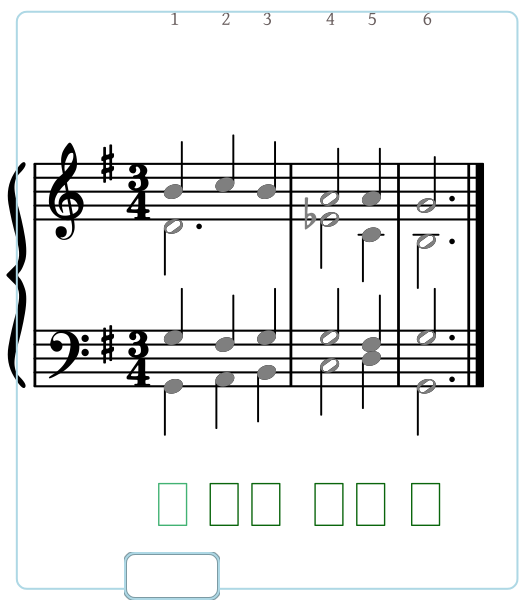 To enter an augmented sixth chord you type the name of the chord and (optionally) its inversion. Harmonia distinguishes between four types of augmented sixth chords: Italian, German, French and Swiss. The Swiss augmented sixth sounds the same as the German but is based on a different chord root and so is spelled differently (see below). If the augmented sixth has no explicit inversion number, it's inversion will default to positions that causes the lowered-submediant scale degree to be its bass tone. If no inversion number is specified for an Italian sixth, it will be in first inversion, e.g. It6. If no inversion number is specified for a German sixth, it will be in first inversion, e.g. Ger65. If no inversion number is specified for a French sixth, it will be in second inversion, e.g. Fr43. If no inversion number is specified for a Swiss sixth, it will be in second inversion, e.g. Sw43.